The plane went down in Mississippi with fatalities.Prayers out to the families of the aircrew. Recovery personnel claim 16 were killed.The FBI has joined the investigation. The FBI has reportedly joined local and state agencies to investigate what caused a U.S. Marine Corps KC-130 to corkscrew out of the sky and into a soybean field in Mississippi, killing at least 16. The search for additional victims is continuing. The Marine Corps said the aircraft “experienced a mishap.” The plane spiraled down at about 4 p.m. in a field about 85 miles north of Jackson. The plane’s debris were scattered in a radius of about five miles. I saw a note about that yesterday. My deepest condolences to the family, friends and squadron mates of the fallen. The Marine Corps has released a statement. There were 15 Marines and a Corpsman on board the aircraft. The Marine aircraft that crashed Monday evening was a KC-130T from Marine Aerial Refueling and Transport Squadron (VMGR) 452, Marine Air Group-49, 4th Marine Aircraft Wing, Marine Forces Reserve. The flight originated from Marine Corps Air Station Cherry Point, N.C., as the squadron was supporting a requirement to transport personnel and equipment from there to Naval Air Field El Centro, Calif. The crew and passengers consisted of 15 Marines and one Navy Corpsman. Equipment on board included various small arms ammunition and personal weapons. An Explosive Ordnance Disposal team is at the scene as a precaution in the interest of safety. The identities of the personnel whose lives were lost in this tragic accident are still being withheld to allow time for their loved ones to be notified appropriately. While the details of the incident are being investigated, our focus remains on providing the necessary resources and support to the family and friends of these service members as they go through this extremely difficult time. The Marines have a serious maintenance problem with only 41% of its aircraft flyable. It no doubt has alot to do with previous budgets and fewer maintainers. Six of the Marines and a Corpsman were part of the 2d Raider Battalion. Here is an update.Investigators are looking at the possibility of an explosion caused by munitions that were cargo. Also at least one civilian is being charged with theft from the crash site. people are really stupid to want to steal anything from a crash site. 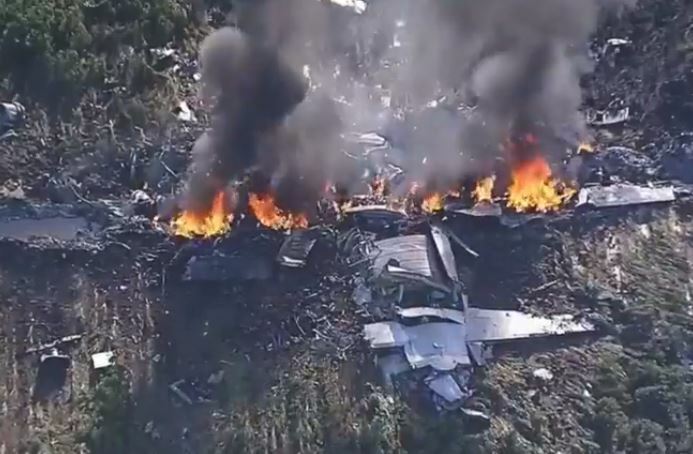 Authorities in Mississippi are pursuing a criminal investigation into at least one individual for taking debris from the ammunition-strewn wreckage site of the Marine Corps KC-130T that crashed Monday and killed 16 service members. Mississippi Department of Public Safety Commissioner Marshall Fisher revealed the criminal probe at a press briefing Wednesday and said federal Bureau of Alcohol, Tobacco, Firearms and Explosives, as well as federal prosecutors in northern Mississippi, are investigating. Video reconstruction of the mishap. Wow that's some video! Thanks for that Dolphin_Hunter. Been around aircraft a while but I have never seen anything like that. That is quite something!!! Such a rapidly cascading component and structural failure is almost impossible to believe possible on a C-130. RIP to those who perished. The contractor is liable for this accident IMO and law suits may follow. While the blade failure on #2 initiated the sequence of events, the #3 prop assembly departure is surprising. My gut tells me that without that secondary failure, just an embedded prop blade shouldn’t have been a single-point catastrophic failure.